If that isn’t the best children’s book title ever devised, I’ll eat my hat. 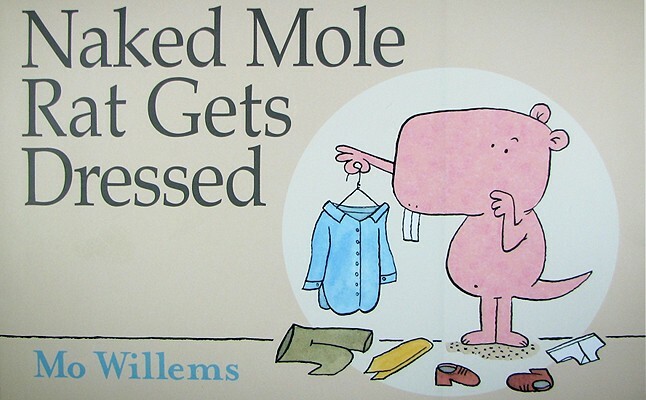 Mo Willems has done it again – this time with a naked mole rat. If your kids adore the penguin who wants to drive the bus, and just can’t get enough of elephant and piggie, then this will most certainly be their new favorite book. In it, Wilbur (said naked mole rat) rebels against his community’s dress code of nothing and dons space suits, tuxedos…to the horror of his fellow naked mole rats. But when the leader of the bunch, Grand-pah, is called in to mediate, they’re soon surprised to find that maybe clothes aren’t such a social taboo after all. Mo Willems can do no wrong, in my opinion. And everything…EVERYTHING…about this book is right.